In an article for The New York Times, memoirist Mary Karr said, “Distinguishing between fiction and non- isn’t nearly the taxing endeavor some would have us believe. Sexing a chicken is way harder.” Certainly, that last line is humorous, but it doesn’t substantiate her rather asinine commentary on fiction and non-fiction writing. In fact, it is worth repudiating this claim made by the famous writer. That is, the line between fictional and non-fictional writing is entangled between what constitutes truth and what defines a falsehood. First, let’s be clear here. It could be said that creative non-fiction writing is essentially a fractionalized rendition of memory. In other words, it is a performance – an incomplete tour-de-force of truth. Often times it can also be expository with journalistic and scientific underpinnings, but it still blends elements of fictionalized storytelling to make it creative. That would be things like dialogue, story structure (or lack of structure as it were), characters and so forth. I find this interpretation to be adequate and admissible in defining the genre of creative non-fiction. It’s a rather liberalized application of telling the truth or presenting a story creatively. As readers, we understand that the contractual agreement between memoirist, journalist, scientist, etc. and reader plainly states, “Some material will be made up.” This is permissible on the aforementioned grounds and because, plainly, it’s imperative to good storytelling. Now while this may seem radically in contrast to traditional notions of the writer/reader contract, this does not mean the writer makes everything up or that the reader expects everything to be made up. Only that, certain components as necessary, will be created in contradiction to reality. This means mostly dialogue, but could also be scene. Like Karr mentions in the Times article, Tobias Wolff’s This Boy’s Life was entirely based on recollection – so it’s likely that some scenes were fabricated. In actuality, Mary Karr agrees with me that it is permissible to make some parts up. In an interview with Slate magazine, Karr reveals that she altered the story of a friend’s wrist cutting because she “let literature rule over fact.” Readers and fans of Mary Karr shouldn’t lambaste her for this on grounds that it was unethical to do so. While creating an entire story based on Karr’s quote of letting “literature rule over fact” would be wholesale-fictionalized storytelling; it’s okay in some instances in order to align with other ethical qualms (such as the friend requesting to be left out in Karr’s example). In essence then, one must say that even the line between what is ethical and what isn’t involves context and is blurred. As such, one couldn’t then postulate that the line between fiction and non-fiction is naively black and white, as Karr erroneously did. In lieu of making ethical and fictional/non-fiction distinctions, let us not be remiss in deciding the parameters on what “good” creative non-fiction is. 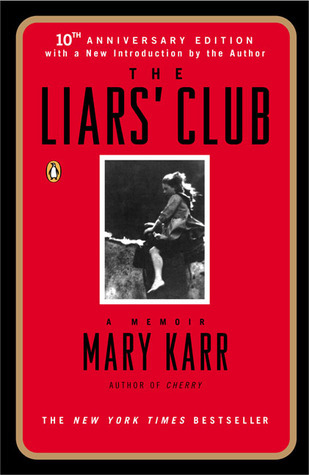 Mary Karr is a great writer and more specifically, a great storyteller. This does not mean that her memoirs are permeated by lies, but rather that her fractionalized recollection of memory is perpetuated by fictionalized techniques. Non-fictional writers must utilize metaphors, similes and other techniques that fictional writers use to elevate their story from mere expository truth-telling to creative truth-telling. We see examples in both Tobias Wolff’s book and Mary Karr’s. In Tobias Wolff’s book, it opens with a metaphorical scene involving a truck having driven over a cliff. Metaphor is a universal component to either fiction or non-fiction writing, but especially for non-fiction writing it aides in showing without telling and foreshadowing the events in a book. Even in Karr’s case we see examples of these fictionalized techniques. She uses a simile to describe the perception she had of her grandmother’s amputated leg, “I had expected Grandma’s lopped-off leg to seem more like a doll’s, bloodless and neat.” This works to aptly portray Karr’s younger self in a way that makes sense within that context. This usage of fictionalized techniques is not emblematic of ethical abatement. Rather, as Tobias Wolff says in the preface to his book, “…this is a book of memory, and memory has its own story to tell. But I have done my best to make it tell a truthful story.” As readers, we must control our critical scorn in dictating that the truth is told with arduous accuracy. As writers of creative non-fiction, it is our duty to do “our best” to tell the truth. We must realize that while the line between fiction and non-fiction is fuzzy at times, it is a labyrinth worth journeying in order to probe that truth. Ultimately though, Karr’s scorn of Frey is well intentioned for the sake of truth-telling and while some may argue Frey’s fabrications and alterations are merely trivial, if they contradict reality as can be proven factually, then it’s a breach of contract between writer and reader. Therefore, Karr rightfully throws Frey under the buss for his shortcomings, but becomes short-sighted in understanding the clear entanglement between truths and lies.